Transfer from your hotel to the airport of Lima. Welcome and reception at Iquitos airport. Walk through the forest surrounding the Lodge. At night, listen music in the Bar "El Tucan". Visit to the Native Community of Yaguas. 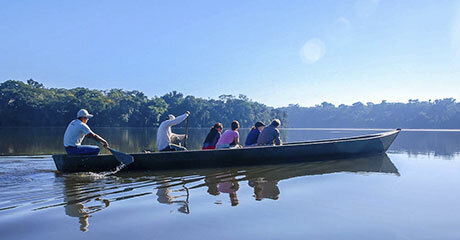 Excursion by boat in the Amazon Jungle. Transfer to airport in Iquitos. Transfer to your hotel in Lima. Air tickets are not included , we can book them in behalf of you, prices depend on dates and times, please consult before. 1 Transfer from Iquitos airport to our Lodge. Tours as described in the program. Iquitos Ceiba Tops Reception at the airport, brief city orientation and transfer to the Explorama dock. Twenty-five mile journey down the Amazon River to Ceiba Tops, where rooms with air conditioning and private bathrooms provide the comforts of home in the rainforest. Afternoon hike in the beautiful primary rainforest reserve surrounding the lodge which includes many huge trees festooned with epiphytes. After dinner there may be local flute or guitar music at the El Toucan Bar or the guides are always ready to relate some of the many legends of the Amazon forest. Ceiba Tops Morning boat ride, spotting for dolphins, to visit a small village of Yagua Indians where your guide will explain the local Yagua Indian culture and how it was affected by the arrival of Europeans and the passing of time. There will also be an opportunity to see some of the local crafts and for a demonstration of the blowgun which some of the Yagua elders still use for hunting. Afternoon walking excursion to the neighboring town of Indiana. Originally a Franciscan mission, Indiana has grown into a large river community with its own market, high school and small hospital. Ceiba Tops in Iquitos Your choice of morning walking or boating excursion to further enjoy the rainforest and Amazon River. Afternoon transfer to Iquitos airport.